Last Thursday, a thousand peasants marched toward Cobija to protest the violence driven by the Prefect Leopoldo Fernández, when they were ambushed on a bridge located 7 kilometers from the town of Porvenir, in the department of Pando. This was the scene of a massacre, executed by civilian groups who’d received weapons training by the government of Leopoldo Fernández. Initially on Thursday there were 8 deaths reported. The figure was rising steadily, to 9 dead, then 14, later 15. This Saturday evening, the government minister Alfredo Rada confirmed that there were 30 dead. But other officials fear the figure could reach 50 or even 70. The lack of exactness in the figures is due to the fact that the Prefect Fernández and the armed gangs he commanded prevented the arrival of humanitarian organizations at the scene of the massacre. The government declared a state of siege last Friday, after the soldier Ramiro Tañini Alvarado was killed by .22 caliber gunfire, when civilian groups faced off against the military over control of Pando’s airport. Prefect Fernández had insisted that what took place on Thursday had to do with an armed confrontation “initiated” by the national Bolivian government. The facts contradicted him. Roberto Tito, one of the rural workers who was at the bridge when the shooting began against defenseless people, bore witness that they’d marched unarmed, but right away they heard the shots and some people began to fall, mortally wounded. Snipers located in the upper reaches of the trees shot toward the crowd without considering that children and women were mixed in with the peasants, whose only weapons were sticks and machetes. “We were unarmed, contrary to what they said. They stopped us some seven kilometers before Porvenir and afterwards they attacked us when we reached the bridge, where they ambushed us and began to shoot with automatic machine-guns,” said Tito, sorrowful over the deaths of at least 10 of his comrades, now that since Friday an undetermined number of missing have been reported. “The comrades had to escape wherever they could. They didn’t spare even the children or the women. It was a massacre of the peasants; it’s something that we must not allow,” said the rural worker. Tito’s testimony is backed by the version of Senator Abraham Cuellar, who insisted that at the height of the Bridge of Cachuelita, there was a gap 10 meters wide and deep so that neither trucks nor people could pass. It was in these circumstances that the shooting began. “The people were walking on foot, there had been an ambush prepared by the Prefecture, planned with military weaponry and with the regrettable result that there were many deaths on the side of the peasants and the majority are from jurisdictions governed by mayors that are not associated with MAS [Movement Toward Socialism] but rather with organizations that support the government,” said Cuellar. As far back as September, 2006, the then Government Minister Alicia Muñoz denounced the Prefect Leopoldo Fernández for training at least a hundred paramilitaries in Cobija, under the pretense of forming a “citizen’s protection” force. Although Fernández denied the veracity of this denunciation, for which Muñoz had photos and videotape proof, the head of Citizens’ Security for the Pando Prefecture, Alberto Murakami, admitted to the training of civilians. Murakami claimed at the time that it was a hundred “neighbors” trained to perform monitoring, in the face of “delinquency” and a “deficit of policemen.” Muñoz made the denunciation as proof that the opposition prefects were not acting as legitimately as they insisted. Time and the massacre of defenseless people, regrettably proved the ex-Minister correct. In the middle of the massacre, the peasants had only one alternative to save their lives, and they ran for the bushes while the paramilitaries unloaded their weapons on the crowd. “They are people from the Prefecture and the Departmental Roads Service who are well armed with machine-guns and snipers, because they shot freely at us from the treetops,” said Tito. The peasant leader’s denunciation was corroborated by Senator Abraham Cuellar, who said that this Friday, 24 hours after the massacre, the paramilitary persecution of the Pando peasants continued. “We know that the persecution has been relentless in Filadelfia and Cachuelita, which are provinces surrounding Cobija; the killings continue, they are continuing to murder people, unarmed people,” said the legislator. He accused assassins hired by the Pando authorities, who go about armed with automatic weapons, something which has forced at least a hundred people to cross the border into Brazil to seek refuge. In this context, the mobilization of people from the Prefecture, Sedcam, assassins and paramilitaries hired by Prefect Fernández, supposedly to reclaim a redirection of 30 percent of the resources from a Direct Tax on Hydrocarbons, was the cover for mounting a tough repression. Cobija (ABI). - A humanitarian commission, headed by the Presidential Minister Juan Ramón Quintana and Health Minister, Ramiro Tapia, arrived at 5 p.m. this Sunday in Porvenir, Filadelfia, Puerto Rico and other conflict areas to undertake a search for missing people and attend to the wounded, victims of a massacre executed by hired assassins sponsored by Pando’s prefecture. The commission, previously in Cobija, inspected the health centers, above all, Hospital Roberto Galindo, to evaluate the wounded. After visiting the wounded and receiving a clinical report from the directors of these centers, the Health Minister, Ramiro Tapia, assured that all those who were part of the massacre at Porvenir are receiving medical attention. To evacuate dead and wounded, three ambulances are making the rounds of Porvenir, Filadelfia, Puerto Rico and other communities. The situations of the people or bodies recovered from all these areas will be analyzed in order to bring them to La Paz or to Cobija. “The President has asked us to assist with the humanitarian support for people who are missing, wounded and have not had the necessary support,” said Minister Tapia. The governmental humanitarian aid commission arrived this Saturday at 2:00 a.m. at the “Aníbal Arab” airport in Cobija, headed by the Presidential and Health ministers in order to begin the work of helping and searching for missing peasants. The Peasant Workers’ Federation of Pando reported that there are 25 dead and 25 wounded as well as 106 people missing after last Thursday’s brutal massacre in the town of El Porvenir. The leader Luis Adolfo Mayar, in statements to the Erbol Network, reported that nine dead had been identified, while 16 were still not claimed by their families. According to the government, the number of dead is at 30, since in recent hours additional bodies of peasants were found in the bushes and rivers of the area where the slaughter took place. In all, the wounded presently total 25, but it is possible that in the next few hours the number could increase, since many people fearful of being victimized, can be found hiding in the houses of family or friends, said the leader. Mayar said that 106 people are missing, a number that continues to increase as time goes by and reports continue to come in to the peasant communities about people who still have not returned to their homes. Bolivian military forces finally took control of Cobija, capital of Pando Department, but they have not apprehended the prefect, Leopoldo Fernández, whose detention was ordered on Saturday. It’s feared that the final number of those killed in last Thursday’s massacre may be much higher. Early this morning the Bolivian Armed Forces took complete control of the city of Cobija, capital of Pando Department, where a state of siege had been declared last Friday after an ambush and slaughter that took the lives of many peasants. The first unofficial reports indicated that armed separatist groups who controlled the city, at the command of Pando’s prefect, Leopoldo Fernández, did not offer much resistance. The operation took place between one and two in the morning today, September 14. The first reports from the Erbol Network indicated that the military operation has taken control of practically the entire city and that shortly a commission will head for Porvenir where the massacre of peasants took place last Thursday. Until now, Pando’s prefect, and the armed civilian groups that he commanded had obstructed the entry of humanitarian organizations to the scene, and while initial reports mentioned 8 deaths, the figure has increased as the days have gone by. According to the first reports of certain authorities, there were no casualties among the Armed Forces this Sunday. Last Friday evening, the soldier Ramiro Tañini Alvarado was killed, a shooting victim when the military forces faced off against armed civilian groups who were holding the Cobija airport. On Saturday evening, the government minister Alfredo Rada, reported that the number of peasants killed in Porvenir had reached 30. “The magnitude of the massacre which took place in Porvenir surpassed that of the El Alto massacre in October, 2003, where there were 60 killed while in Porvenir the number approaches some thirty deaths. If a comparison is made between the population of El Alto and that of Pando, it will be evident that we are facing the most bloody slaughter in democratic times,” said Rada, at Palacio Quemado. 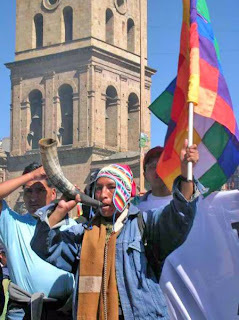 The government fears that the death toll will grow with each passing day, and has demanded that the national Congress begin an investigation into the bloodiest genocide of recent times in Bolivia. “It’s not a movie, it’s the truth: there were children, women, we don’t know how many were killed, the attack, the ambush began at 10 and went on until 5 in the afternoon. I got away because I hid in the bushes,” a survivor of the Porvenir massacre told the Erbol Network.